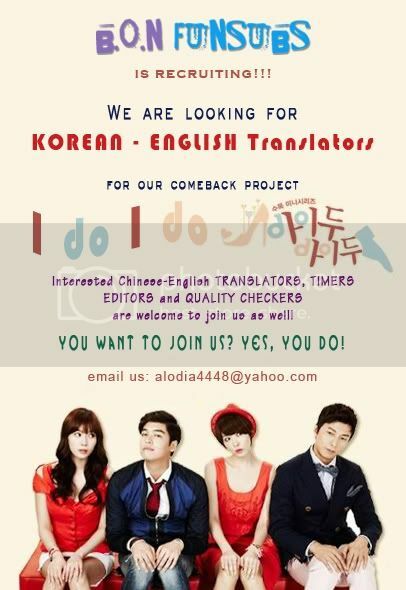 We’re currently in urgent need of Translators, but Timers and Editors are definitely welcome too! We are a small (and friendly!) community but are looking to expand and would love to have you! Please support us if you can! Anyone subbing the korean movie "Blind"? I have noticed the website dramafever using fansubs for profit (ad revenues). I was just wondering if anything could be done about that? I realize that there are copyright concerns with fansubs to begin with and that fansubbers have no rights about claiming their subtitles/work, but I also think it is unethical for websites to gain profit off using fansubs in streaming videos. does anyone have eng subs for "CRUCIBLE or Dogani" and "always - so ji sub's movie"??? Where can I download subbed "The Moon that Embraces the Sun" ? I'm not sure where you can download hardsubbed videos of the series but they're pretty much available everywhere for streaming. Soft subs can be found here or here. And you download the softsubs separatedly because hardsubbing is not so common now. where am I be able to find english sub? Hi, new to Korean culture and was just wondering if anyone knows where I can get download or get english subtitles for MBC's special "Kim Tae Hee Rediscovery"? Where can I get subbed "Architecture 101"?